Back to the Minors is our weekly look at Jacksonville's awesome minor league sports scene. This weekend is shaping up to be pretty awesome, with four games (and two fireworks shows) at the Sports Complex. 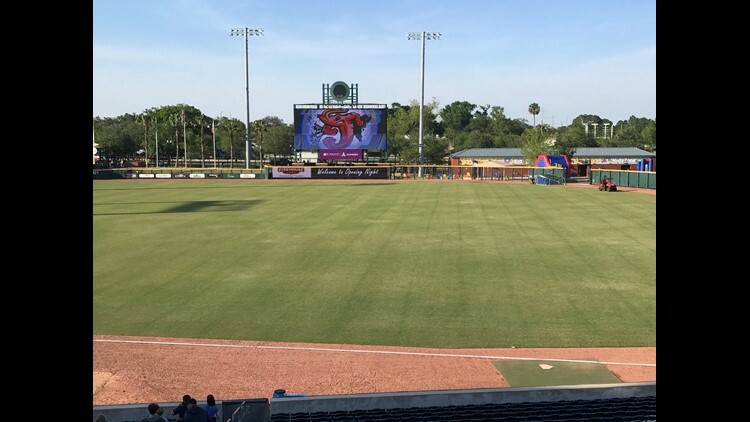 The Jacksonville Jumbo Shrimp continue their first homestead of the season with games against the Mobile BayBears all weekend. It's the first Fireworks Friday at the Baseball Grounds for 2018 with first pitch set for 7:05 p.m. If that's not enough, the Shrimp are also offering post-game fireworks on the first six Saturdays of the season, including this weekend when the first 2,000 fans get a free t-shirt designed by Shrimp fan. First pitch Saturday is at 6:35 p.m. It's OPENING WEEK that means FREE t-shirts to first 2,000 fans Saturday, courtesy of @121Financial & @atlanticssfl Buy tickets in advance to save $2 off the walk up price! Saturday night across A. Phillip Randolph Boulevard is also the home opener for the defending National Arena League Champs, the Jacksonville Sharks. The Sharks won their opener on the road last weekend 41-38 and will take on the Massachusetts Pirates at Veterans Memorial Arena with kickoff set for 7 p.m.
Get your Tickets to the home opener THIS SATURDAY! The Shrimp close out the busy weekend with the first "Family Sunday" of the season where kids get to run the bases post-game. First pitch as at 3:05 p.m. They did it again. The Jacksonville Giants are once again the American Basketball Association Champs, winning this year's ABA tournament in enemy territory in Austin. Meanwhile, the Jacksonville Armada are getting close to opening up their first season as a member of the National Premier Soccer League. The team lost a preseason friendly Thursday night in Charleston, SC against the Battery 1-0. The team next travels to Atlanta for their final preseason match on April 21 against the Silverbacks. They open the NPSL regular season with a matchup against fellow NASL refugee Miami FC in South Florida. The first time fans in Jacksonville can see the Armada at home will be in a U.S. Open Cup play-in game against Villages FC at Southern Oak Stadium at Jacksonville University. Single match tickets are available here. Finally, your headline of the week, courtesy of ESPN.com "Empty Jeet seats: Marlins outdrawn by Double-A affiliate". In case you need a reminder, the Marlins AA affiliate is the Jacksonville Jumbo Shrimp. Have fun and get out to some games this weekend. Go Shrimp! Go Sharks! Back to the Minors author Neal Bennett is the former digital director at First Coast News. He's a huge fan of all of Jacksonville's minor league teams. He works for FCN's parent company, TEGNA media.